Zu den Zeiten der großen Expansion im Hifi-Bereich in den Jahren 1970 bis 1975 suchten die neu auf den Markt gekommenen (deutschen) "Distributoren" (ganz offensichtlich alles Studenten der Juristerei), nach immer neuen noch nicht bekannten (ausländischen) Hifi-Firmen. Und derer gab es in den USA ganz ganz viele. So nahm auch Michael Giessen nach seinem esten USA Besuch ein neues Produkt in seinen Vertriebsweg auf. Die Frontplatten waren golden mit sehr konservativen ebenfalls goldenen geriffelten Voll-Alu-Knöpfen. Die Endstufe war in in einem schmächtigen Lichtblau lackiert, war extrem schwer und hatte zwei riesige silberne Netzteil-Kondensatoren. Nach meiner damaligen Meinung war das ganze C/M Design bereits damals optisch nicht mehr zeitgemäß, zumal die Japaner mit blitzblanken gebürsteten Silber-Frontplatten auf den Markt drängten. Doch das war noch nicht alles. Diese C/M Lab Geräte hatten überwiegend Germanium Transitoren verbaut, also in 1970 hatten sie noch diese alte Technik mit all ihren Wärme- und Rauschproblemen - und das würden die Tester hier bei uns in der Hifi-Stereophonie sofort herausfinden - und natürlich auch negativ kritisieren. Das Produkt war eigentlich nicht mehr verkäufich. So landeten nach vielen Monaten alle unverkaufbaren und sehr schweren "Kisten" bei mir und ich stellte fest, sie klingen nicht. Darum hier mal ein solcher "Test" bzw. ein "report" eines US Magazines aus 1970. C/M CC-50S, a stereo integrated amplifier. Dimensions: front panel, 17 by 6 inches; depth chassis, 13 inches. Price: $387. Manufacturer: C/M Laboratories, Inc., 575 Hope St., Stamford, Conn. 06879. COMMENT: If solid-state can now be credited with having been able to produce an abundance of high performing receivers, its contribution to single-chassis or integrated amplifiers is even higher as far as performance is concerned and a close second in terms of number of models available. That is to say, while today's all-in-ones (tuner/amplifier combinations) are better as a group than those of a few years back, thanks to the canny application of transistor circuit techniques by the high fidelity industry, this same know-how can make an all-out designed amplifier better to an even greater extent. The differences, to be sure, are often slight and not nearly as obvious as they were between all-in-ones and separates in the days of tubes and transformers. But they do persist; the art advances constantly. In this context, we have in recent months reported on several new integrated amplifiers of very high performance. The present model from C/M Labs now joins this distinguished roster. The front panel sports three types of operating controls, grouped according to function. At the left is a row of push buttons for input signal selection - similar to those found on C/M's earlier preamp/ control unit. Across the center are five large knobs for mode, bass, treble, channel balance, and volume. The bass and treble controls operate on both channels simultaneously. Under this group a hinged metal plate drops to reveal six rocker switches for tape monitor, high and low filters, bass and treble in or out, loudness contour, and a stereo headphone jack. The power switch, another rocker, is located just to the right of the hinged plate. Two pilot lamps are used: a red one lights up when the power is on; a green one comes on when any of the other rocker switches is used. The idea is to keep out of sight those controls least often used, and yet to signal you when one or more of them is on. Input jacks in the rear correspond to the pushbutton signal selectors, and there is a pair of jacks for tape feed to a recorder. The speaker connectors, on a barrier strip, are rated for 4 to 16 ohms impedance. Four AC outlets - three switched, one un-switched -are provided for operating other gear. In tests at CBS Labs the CC-50S met or exceeded all of its specifications. Power output was clean and high across the audio band; distortion for the most part remained just about at the residual level of the measuring instruments. Frequency response, virtually a flat line to 20,000 Hz, was down only 4 dB at 100,000 Hz. Exemplary square-wave response, for both low and high test signals, indicated firm solid bass and very clean transients. Equalization for both magnetic pickups and tape heads was highly accurate. The tone controls had somewhat greater range than most amplifiers; in contrast, the loudness contour compensation was moderate but it proved enough for our tastes. Rumble and scratch filters seemed mild and probably wouldn't do too much for a really noisy turntable or terribly beat-up records-but who'd expect such items to be used with an amplifier of this caliber? Indeed, to really appreciate the CC-50S, you should drive high quality speakers with it and feed good program material into it. The result will be as good as you can get from an integrated amplifier these days. A word on the signal-to-noise figures reported here. These measurements were made at mid-frequencies, which is customary. However, the manufacturer's published specification for S/N is referenced to the low frequencies, which he feels is a more significant area to clock this behavior. This explains the difference: actually, S/N in the CC-50S is a function of the frequency at which it is measured. And at 50 Hz, the S/N is 68 dB. C/M claims 70 dB, but who's quibbling? Equipment reports are based on laboratory measurements and controlled listening tests. Unless otherwise noted, test data and measurements are obtained by CBS Laboratories, Stamford, Connecticut, a division of Columbia Broadcasting System, Inc., one of the nation's leading research organizations. The choice of equipment to be tested rests with the editors of HIGH FIDELITY. Manufacturers are not permitted to read reports in advance of publication, and no report, or portion thereof, may be reproduced for any purpose or in any form without written permission of the publisher. All reports should be construed as applying to the specific samples tested; neither HIGH FIDELITY nor CBS Laboratories assumes responsibility for product performance or quality. Kommentar : Was sagen diese Messungen ?? Eine völlig nichtssagende Beschreibung eines 18 Kilo schweren Gerätes, mit der niemand außer dem Vertriebs-Marketing etwas anfangen konnte und kann, vielleicht 50 Jahre später irgendwelche ebay Gaukler. Das ganze Geschreibsel ist ebenso wertlos wie das von dem Grundig MXV100 Vorverstärker, der brilliante technische Daten aufwies und aufweist, aber einfach nicht klingt. 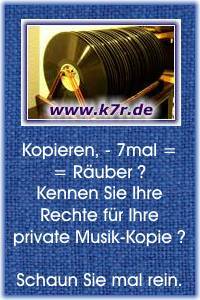 Auch hier in 1970 - Kein Wort über einen Musik- oder Klangtest mit verschiedenen Musiken an verschiedenen Lautsprechern wie meist bei Karl Breh, kein Wort davon, daß diese Kisten glühend heiß wurden und dazu auch noch gestunken haben, wie heutzutage manche Chinesen oder Koreaner. Auch der 110 Volt / 60 Hz Netztrafo hatte bei uns laut gebrummt. Ein Amerikaner aus Atlanta wollte auf ebay 1.500 Dollar für solch einen CC50S haben, der damals keine 300 Dollar wert war. Der Spruch "SOME SAY BETTER THAN McINTOSH !!" ist natürlich absoluter völliger Quatsch. Die gleichen dummen Sprüche wie bei uns im deutschen ebay: Mein Opa, der vor 15 Jahren gestorben ist, hat gesagt .... das Bandgerät laufe wie neu.